Yesterday, I had the pleasure of visiting Sablon in West Village for my very first media tasting. I'm in West Village all the time and I've passed by several times, but have never actually stopped to try the delectables on the menu. Interestingly, the timing was perfect because now I can share it with you for National Chocolate Day! The concept of Sablon Chocolate Lounge was created by Sudhir Shah after an inspiring trip through Europe and was born in early 2016. The space was very relaxing and the overall atmosphere was a reflection of chocolate in every way -- from the dark reclaimed wood to the artistic interior touches. Sablon is Dallas' first and only premium dining lounge that offers couverture chocolate dishes, drinks, and savory bites. I'm seriously kicking myself for not going much sooner! They have everything from hot chocolate to fondue to shots (minus the alcohol). It's insane in the most amazing way. This spot is perfect for laid-back business meetings, date nights, or simply catching up with friends. Hazelnut Hot Chocolate in a cuddle cup | Delicious creamy hot chocolate with actual hazelnuts. I loved that it was not too rich. It was still flavorful yet sweet and pure. Chocotails (Mint & Caramel) | These had the most adorable presentation with in chilled mason jars. Reminded me of a milkshake, but creamier. Cheese Fondue | There are seven fondue options. Each fondue is served with a choice of four dippers. Fondue Options | There is Almond & Cheese, Zesty Fiesta, Broccoli, Spinach & Cheese, Pesto, Original Cheese, and Pizza & Dips fondue. Chocolate Fondue | This delicious fondue is every girl's dream with sweet strawberries, bananas, kiwi, and pineapples to dip. 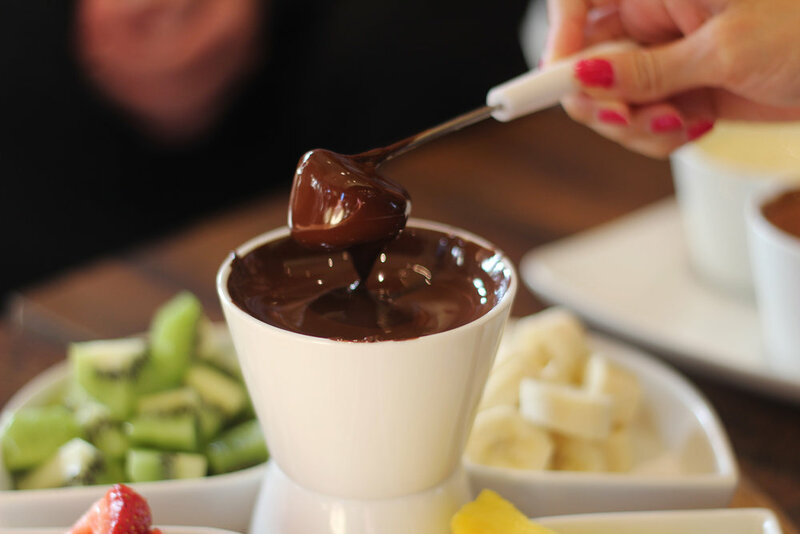 Fondue Chocolate | Chocolate Fondues are served with dark, milk, and white chocolate sourced from Belgium and Italy. Sugar Waffle Wonders | We were served the Igloo Waffles to taste which are warm Belgium sugar waffles served with melted chocolate, 2 scoops of chocolate & vanilla ice cream, and chocolate chips. I will definitely be visiting again very soon. My birthday is actually next week, so I might have the perfect excuse to indulge! I practically live in this area for meetings and now I have a new spot to recommend on my radar. If you're in the mood for something sweet or a cute date night, pop in for a unique chocolate experience. The prices are excellent and you won't break the bank to satisfy your craving.